The interplay between autism spectrum disorder, genetics and environmental toxicity has been the subject of research for many years. Recently some incredible and disturbing research findings are proving what many have long suspected. One of the key reasons for the dramatic rise in autism rates in the last 15-20 years can be attributed to environmental toxicity. Children with ASD are genetically more susceptible to oxidative damage and environmental toxins than children with typical development. In the 1950’s, Denham Harman, launched the free radical theory of aging. We now know definitely that compounds called free radicals cause oxidative damage and cell death. People with low oxidative stress and high antioxidant status live longer and have less disease. In autism, research has shown that oxidative stress levels are very high and that antioxidant levels are very low. Antioxidants protect all of us from the many harmful chemicals and substances circulating in food, air, water and land. There are essential for normal development. Environmental toxins like metals, chemicals, pesticides and other harmful substances, lower antioxidant levels. Our bodies have 7 detoxification pathways that are supported in most part, by antioxidants. The relationship between development and detoxification is intricate. This intricate balance is needed for children to thrive and gain new skills. The brain starts developing early in embryonic life and continues developing into adolescence. The developing brain is very sensitive to environmental exposures. The relationship between genetics and the environment is well known. The way genes are expressed depends heavily on the signals given from the environment. Lung cells exposed to tobacco smoke have a higher rate of developing dysfunction like cancer. Our genes react to protect the body from toxins. Bisphenol-A effects genes important to regulating and supporting development. Published research by Dr. S. Jill James, PhD and principal researcher at the Arkansas Children’s Hospital Research Institute showed that children with autism have depleted stores of glutathione. Glutathione is one of the body’s most important antioxidants that support detoxification of toxic substances. James’s research identified that children with ASD had up to 80% of this important compound depleted. One of the most important things to understand about glutathione and development is that the brain relies 100% on glutathione to support development. As glutathione levels decrease, so does the “fuel” needed for development. When baby’s are conceived, they are de-methylated. They grow and develop through a process called methylation. Methylation and detoxification form an important balance that supports development. As one slow, so does that other. Impairments in these cycles have been identified in children with autism and start to explain why children with ASD are so susceptible to environmental toxicity. A ground breaking in 2009, done by researchers at the University of Texas, revealed startling evidence of the environment’s role in autism. The objective the study was to determine if proximity to sources of mercury pollution in 1998 were related to autism prevalence in 2002. The findings showed that for every 1000 pounds of industrial release, there were a corresponding 2.6% increase in autism rates and a 3.7% increase associated with power plant emissions. For every 10 miles from industrial or power plant sources, there a decrease in autism rates. Toxins affect every aspect of our body. Renowned medical doctor and researcher Dr. Needleman has shown the detrimental effect of lead on cognitive development. Lead levels have been linked to ASD, AD/HD and learning disabilities. A study by the Environmental Working Group (EWG) in found an average of 200 industrial chemicals and pollutants in umbilical cord blood from 10 babies born in U.S. hospitals in 2004. Tests revealed a total of 287 chemicals in this small group of children. The umbilical cord blood collected by Red Cross after the cord was cut, identified pesticides, consumer product ingredients, and wastes from burning coal, gasoline, and garbage. It is clear that environmental toxicity is impacting all children and adults. Children with ASD are our canaries in a coal mine showing us how detrimental toxins found in food, land, air and water can be on developing brains. So now that overwhelming research exists that development can be severely impaired by chemicals, pesticides, metals and other toxic substances, what do we do? Protecting our cells from environmental toxicity must be an ongoing commitment. Unfortunately parents, especially mothers, pass their toxic load onto their children. Supporting detoxification pathways, minimizing toxic exposure and healthy diet protects fetuses as they develop. It is also an important strategy to continue into adolescence because the brain continues to develop through children’s lives. 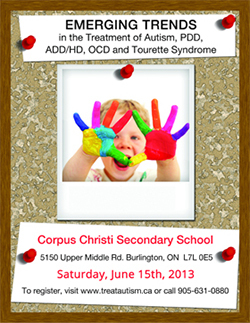 Children with autism benefit developmentally from increasing nutrient and antioxidant status. Many studies have shown that children, who correct nutrient deficiencies, take essential fatty acids and have increased levels of antioxidants, show gains in language, social and cognitive development. While the information on environmental toxicity can be foreboding, new research that shows development can be positively impacted even in the face of considerable toxicity. Children at risk genetically can be identified and protected from environmental insult by supporting biochemical impairments identified in their system. This new understanding means there is hope for autism!